Simply peeking through its Gothic-inspired, glass-panelled doors gives you a glimpse of the regal splendour of its interiors — a space that is simultaneously grand, masculine and reeking of Rajasthan’s splendid past. 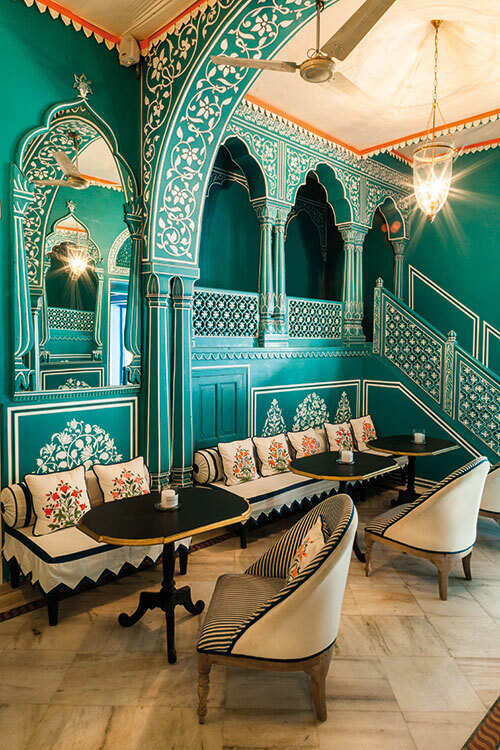 And once you step into Bar Palladio’s vibrant and colourful rooms, you will be drawn into the distinctly Indo-Italian sensibility apparent in the watering hole that is housed in one of the bungalows of the Narain Niwas Palace Hotel in Jaipur. 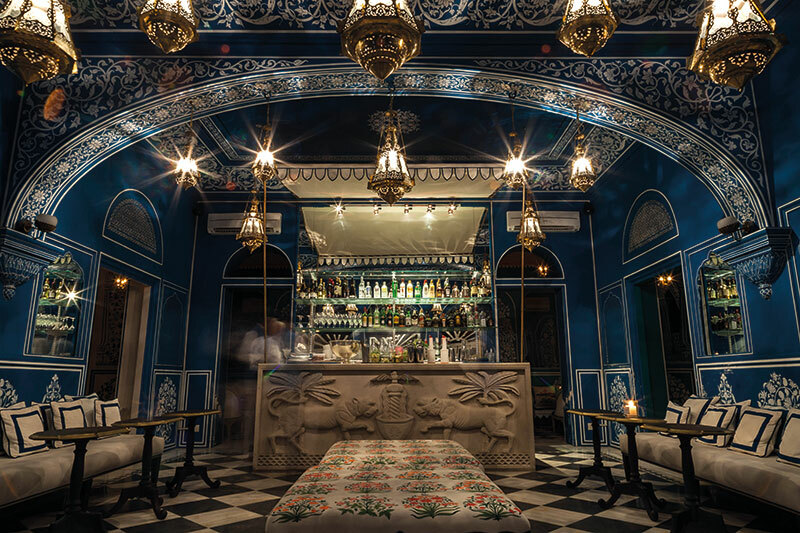 Italian expat Barbara Miolini, who is now based in the Rajasthani city, acquired one of the bungalows from the current incumbent of the Palace and turned it into a social hub for locals and visitors alike. To translate her vision into reality, she approached fellow European expatriate Marie-Anne Oudejans, an international jewellery designer, to fashion its interiors. Having lived in Jaipur for many years, her love affair with Rajasthan is evident. She finds the city magical and felt that “Jaipur was the perfect place to create my new home”. Oudejans and Miolini both wanted the ambience to be decorative and reflect the region’s wall painting heritage. So, Bar Palladio began to take shape and became a place where the past is present but not out of place. Everything in it was exclusively made — from the pistachio rococo china to the bas-relief sandstone bar. The Venetian-esque black-and-white-checked marble floor, fluted mirrors and a gentle interplay of colours gives it its unique feel. 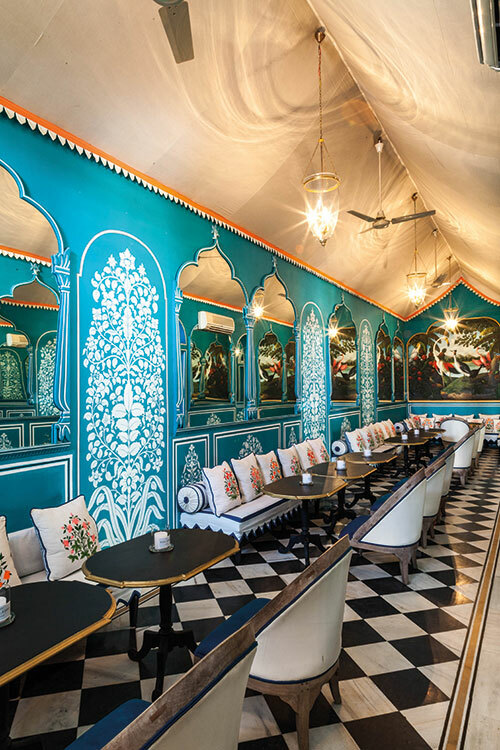 Local artist Vikas Soni, who painted the interior with florals, has added a contemporary touch. The motifs interestingly doff a hat to the Mughal tradition of floral patterning. The blue stairs with their intricate jali and decorative details revive memories of the splendour of durbars of yore. In the Pink City, Oudejans has played innovatively with the colour blue. The predominantly two-colour palette of blue and white creates a cool effect that envelops you when you walk in from the heat. You can say without any degree of doubt that the bar that stands proudly facing the entrance — reminiscent of early 20th-century Venetian cafes — is the showstopper of the space, and quite naturally so. How has your fashion sensibility found expression in the interiors? I have always maintained a style that is breezy, colourful and bold. I have also always loved the block prints in Jaipur. We (Barbara and I) wanted to create a space that is incredibly bold and easy, inspired by different hues and with a focus on the interplay of print and pattern, for I view fashion through print and colour. How has the mix of Edwardian and Rajput influences in the architecture of the bungalow where it is housed impacted the overall effect? Naturally it contributed to the mood and the drama of the space. But, let me add that I would not say that I was inspired by the architecture itself. 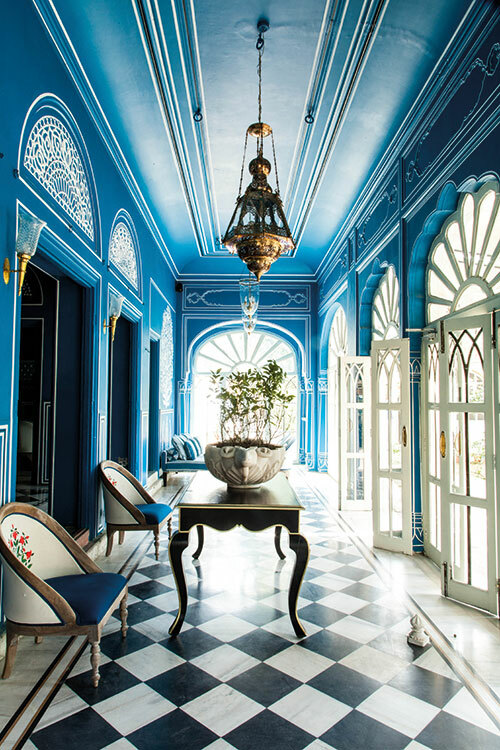 My inspiration came from many different sources — cafes in Venice, Indian palaces, jewellery and the glamorous jet set of the ’60s when they would visit Jaipur. How did you conceive of the interiors at the drawing board? For anything I do, I always make a series of mood boards which tell a story of the space and suggest the required emotion and ambience. Although opulent, with more than a hint of Mughal influences, the place is very contemporary. How did you merge the two? I was given the brief by Barbara — she wanted to give this effortless feel of the past and the present and really capture the essence of iconic places around Venice, a city where she had spent much of her life. We looked towards Caffe Florian and Henry’s Bar as well as the various palazzi of the baroque architect Andrea Palladio. We knew that the space had to feel very modern, but had to be rooted within very old-world, baroque design sensibilities. There is a predominant use of blue and white. We wanted very strong colours that give an iconic feel. The bar was designed along very masculine lines so we needed something very bold that would give a sense of magic for the night. We cycled through many different options and suddenly the blue just clicked and then everything fell into place! How did you ensure that each section has its own identity? The bar was inspired by the classic gentleman’s club — with all its private little receptions, salons, corridors, and rooms. Each area is intended to be different, to impress different feelings, to be a bit experimental. There was so much we wanted to work with so we broke the space down and allowed for different motifs, colours, and ideas to influence the mood of each room. The impact of Rajasthani murals is evident. 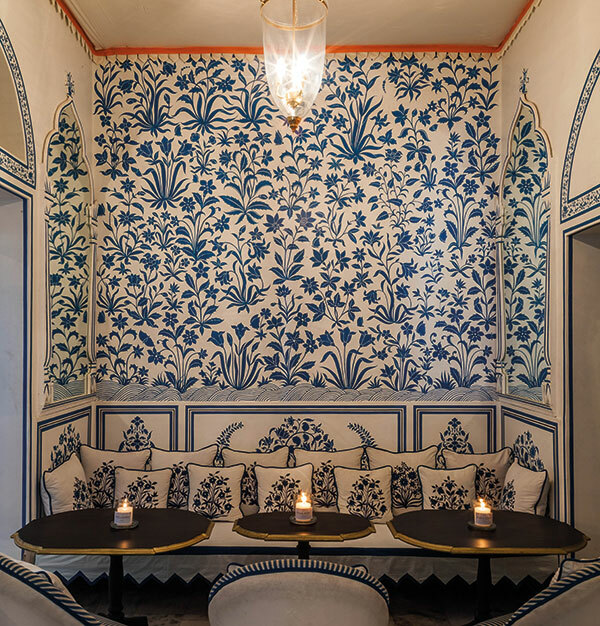 Classical Indian embellishments, floral patterns and huge murals of peacocks have come together in one space. It looks quite effortless as a whole. When you combine so many patterns, even if they do not and should not make sense, they can all be quite harmonious. Part of our natural inspiration was India where both Barbara and I have spent a considerable part of our lives, here in Rajasthan, so that becomes quite a strong point of departure. I wanted to play with different scales and motifs, as well as all these gorgeous Mughal flower motifs. My favourite aspects are actually the hand-painted canvas of the exotic birds in the back salon; these are replicas of 18th-century baroque paintings that I have always loved. What was the thought behind the bar and ITS dramatic panel of tigers and trees? I used to live in Rome and the city is a graveyard of the Roman Empire. The bar counter is actually inspired by the bas-relief tombstones that you find outside the city along the Appia Antica; I thought this would make a very nice bar counter.